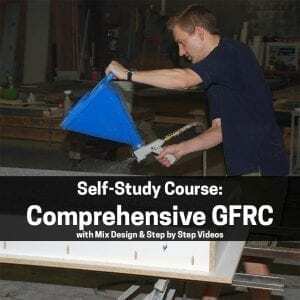 The Comprehensive GFRC Self-Study course is a one of a kind powerhouse of GFRC learning. It goes far beyond a mere video, giving you solid comprehension of how and why GFRC really works, AND how to make it work for you, EVERY time. This digital, online course will be accessible to you 24/7 on our secure customer portal. From there you can access everything you need to study and understand GFRC. At just $199, and no travel required, this class is a fantastic deal. It will pay for itself with the first project you sell. Don’t hesitate. Order now and learn how to do GFRC the RIGHT way, every time.